There are two types of Yankees games these days: Ones in which the starting pitcher is someone the Yankees want in their rotation, and ones in which the starting pitcher is someone the Yankees have been forced to insert into their rotation. With CC Sabathia and Andy Pettitte sidelined (for a little while and a long while, respectively), the Yankees right now are plenty comfortable sending Hiroki Kuroda, Phil Hughes, and Ivan Nova to the mound. Each, after all, has been pitching well lately, and as Will mentioned last week, the Yankees have enough going for them that they should be able to get through this stretch without falling apart. But still, things are less comfortable when someone besides those three has to take the ball. 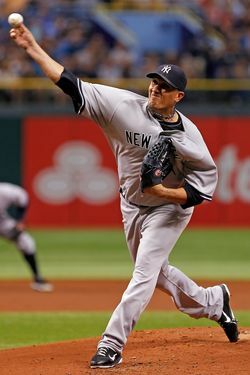 Freddy Garcia, after a pleasantly surprising 2011 season, pitched himself out of the rotation earlier this year. Adam Warren was rocked in his major-league debut last week. And David Phelps, who’s in line to get another audition in the rotation, is a rookie as well (albeit one who's shown some promise this year). This isn’t an especially unique situation: When a starting pitcher gets hurt, his replacement is inevitably going to be less reliable. But the Yankees found themselves in an unusual spot — seeing two starters go on the disabled list on the same day, all while the team sits atop the division standings. And so last night, Freddy Garcia made his first start since April 28, and the good news is that he pitched just fine: five hits and two runs over five and a third innings. He struck out four and didn’t walk anyone. The Yankees would lose the game — David Robertson’s Houdini act failed in the seventh, and Mark Teixeira’s error that inning allowed the go-ahead run to score — but a solid outing from Garcia is encouraging. Remember, if Sabathia really is only going to miss two outings, the Yankees will eventually need just one pitcher to step in and make the starts that would have otherwise been made by Pettitte. It’s possible that Phelps will step up and pitch well and win the job, but Garcia has enough of a track record that it’s within the realm of possibility that he could give them six weeks (or more) of decent pitching. The team’s fifth starter shouldn’t make or break the Yankees, and as Jonah Keri noted yesterday, even with the trade deadline approaching at the end of the month, Brian Cashman shouldn't feel much pressure to make a move. But getting solid contributions from Garcia (or someone else from within the organization) makes it just that much easier to resist making a move unless it benefits them in the long term (which isn't necessarily something he'll be looking to do anyway).